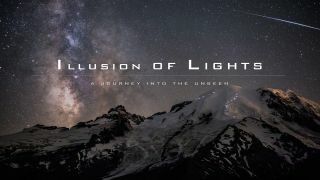 An amazing new trailer from Goldpaint Photography previews the beautiful night sky images captured for the upcoming film "Illusion of Lights: A Journey into the Unseen." Image uploaded Jan. 21, 2015. The video is actually the trailer for a film called "Illusion of Lights: A Journey into the Unseen," an independent movie from Goldpaint Photography. Brad Goldpaint — the movie's director, photographer and editor — has been gathering footage for more than three years, with more shooting still planned. The full film's release is expected in 2017, but you can watch the 3.5-minute trailer for "Illusion of Lights" via Vimeo now. Time-lapse photography itself is a challenge when it comes to shooting night sky sights, according to Goldpaint. In the video, one five second clip of the Milky Way is actually the combination of 150 separate images taken over the course of a night, as the cosmic object moved across the sky, Goldpaint said. A snowy tree stands out against a night sky featuring the brilliant clouds of the Milky Way in a trailer for the upcoming film "Illusion of Lights: A Journey into the Unseen." Image uploaded Jan. 21, 2015. This isn't the first time Goldpaint has created a time-lapse skywatching video, however. The short video "Within Two Worlds," released in 2012, was created using 7,000 photos after three years of shooting and shows beautiful views of the sky and Earth from locations around the western United States. Goldpaint and his partner Marcella Buckner set out to educate people about the potentially problematic effects of light pollution in the modern world in 2013. "The couple sold all their possessions to live in a motorhome while traveling throughout the Western United States, teaching photography workshops and gathering footage for their film," according to a short biography. "Brad spent countless nights traversing in the dark, carrying heavy camera equipment, and braving the dark unseen. Each filmed location presented unique challenges when confronted by lightning storms, dangerous winds, and up-close encounters with bears and other wildlife."